I came across the awesome custom artwork and baseball cards done by Jesse at Ars Longa Art Cards recently. 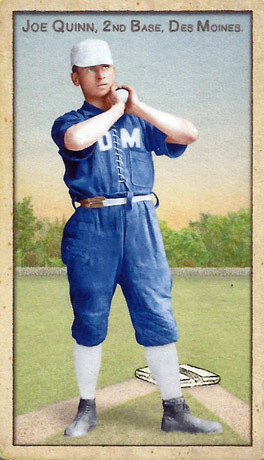 Jesse takes vintage baseball cards and creates modern day custom cards using the vintage designs. There's a lot of research and effort that goes in in trying to make the images historically accurate. I was excited to discover that he had a card of Joseph Quinn, the very first Australian MLB player. Even better was the fact that one of them would soon be coming up for sale. I was fortunate to be able to get it, and it finally arrived in the post last Monday. Here's a enlarged version of the card front. I think the card is awesome - the art work is very well done. More than happy to add this to my collection. It's an awful lot cheaper than the Old Judge card that it was based off of as well. Love Ars Longa cards and Jesse's work - I have a few of these gems in my collection too. It's a shame that these bad boys don't get more attention - this era of baseball is far too often ignored by the baseball card companies today.